For a while (I assume at least to IGQ in Cracov on March) I’m set on these two Gatorman as my paring. I built lists with assumption, that I won’t repeat solos in any of them. 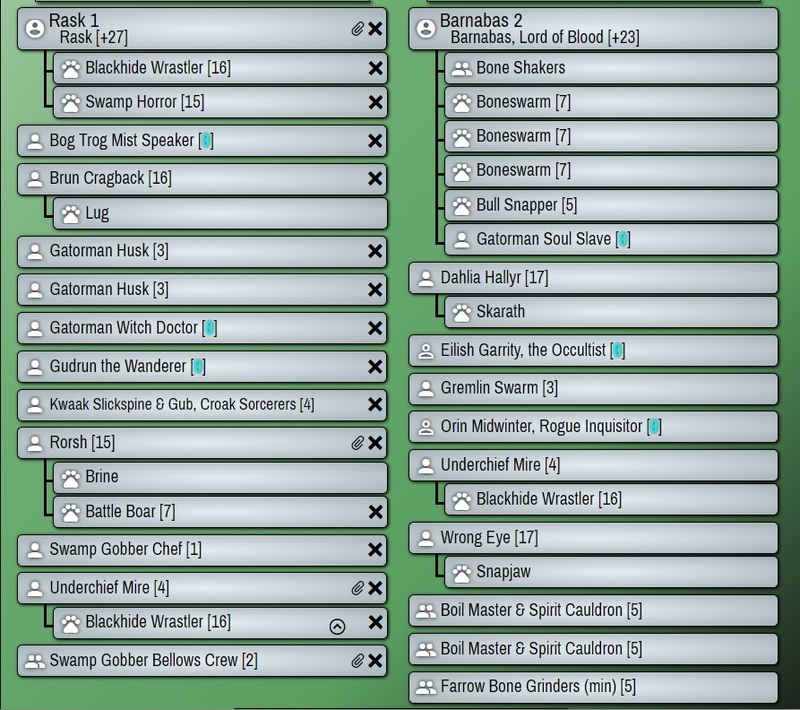 I feel that Barnabas2 list (which is effect of Azahul’s inspiration) is good for me and I need to practice with it. I want it to cover a lot of MU but at the moment I’m not exactly sure which are hard dodge. Rask’s list is supposed to fight with PoM, some Khador list (Sorscha1 :P), and Legion. I’m not 100% set on shape of this list – for example I replaced SoulSlave with Gudrun and I’m deliberating also Longchops in his place. I’m only 100% sure on Husks and not taking 4 free cards. When you play def-skew, dropping it vs Anamg or Kallus1 is never you first choice 🙂 Nethertheless I’m so new to Barny2 that every game counts so I want to check how far I can get with it. Also Amok both limit useage of Gremlin swarm and basiclly nuliffies impact of Rebuke… on the other hand well protected Dahlia (1 transfer for Blightbringer shot and Orin/Mistwalker to negate Hexblast) is nearly impossible to take out by Anamag’s list. For first like 10-15 battle I will take extra time analysing in my head my Deployment and 1 Turn to learn unpacking of the list. 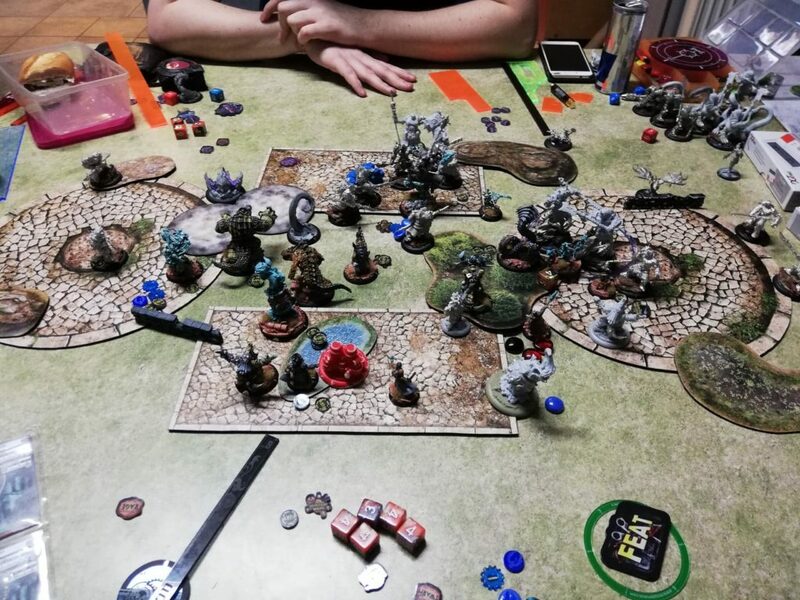 For this battle I win roll to go first, Barnabus goes into middle and Dahlia commits to my right side, to hide behind forest and lock round zone. Everything advances or charges forward. WE cast Submerge and Starcrossed, Dahlia Haunting Melody, Barnabus Onsluaght and EoBN. Both Cauldrons roll max for corpses and two Boneswarms receive food. I jammed myself so Skaryth can’t advance far enough. Snapjaw feels save behind a wall. Everything runs forward, Chosens receive +2 Arm. 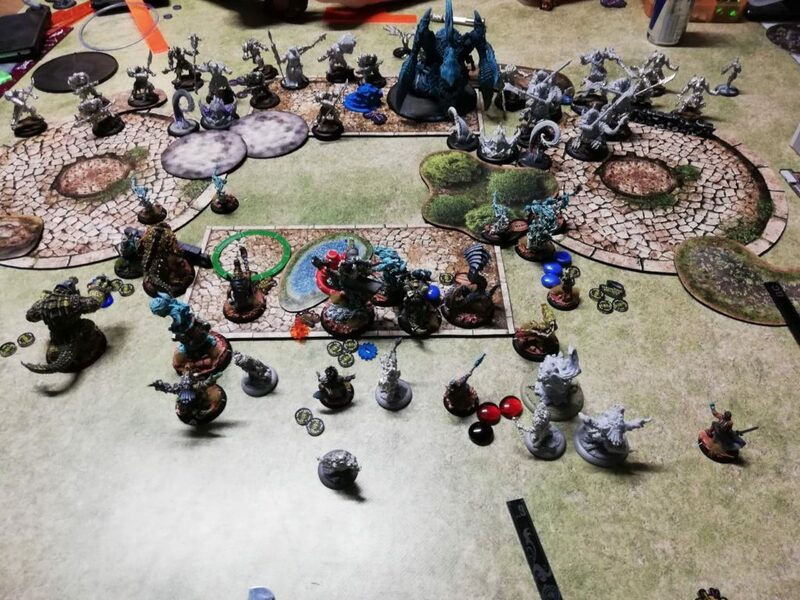 Army advances with spells as before. 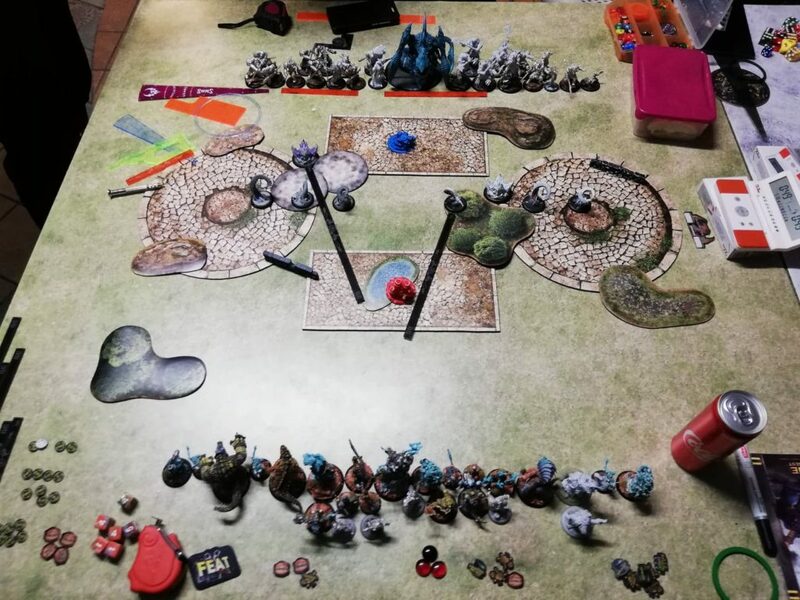 Additional corpses are delivered, left Boneswarm max itself with tentacles, right goes forward and casts swarm animus and I use Gremlin Swarm for annoyance. Mire puts cloud in front of WE for additional protection. On the left tentacles and warmonger miss their attacks (Starcrossed is a thing). 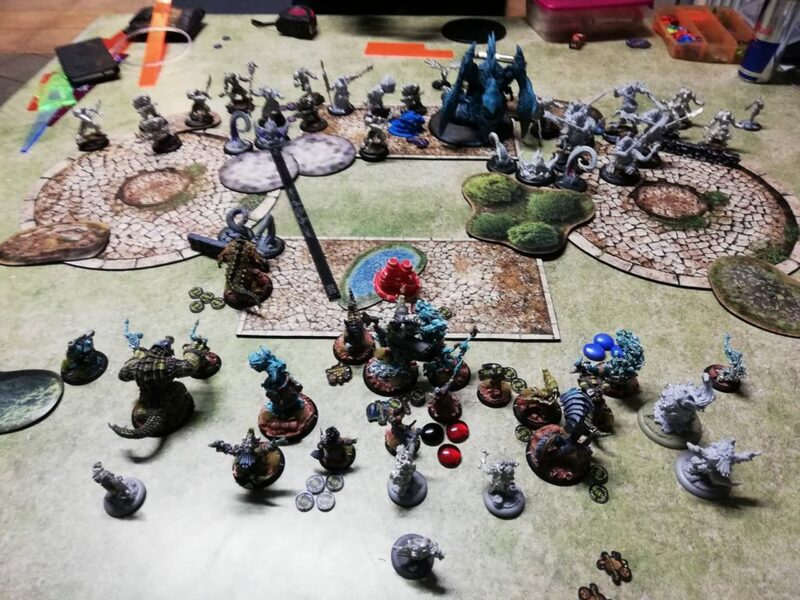 On the right Boneswarm is pulled into tentacle after taking out Boneshaker. Also luckily for me boosted blast dmg into Gremlin Swarm rolls to low to take it out. This turn takes waaay to long to played out. Eilish strips upkeep from Chosens. I kill one Chosen with Raged Bull Snaper and Dahlia covers rest of the unit with her control. I forget to rage Skaryth so I failed to kill Hellmouth. 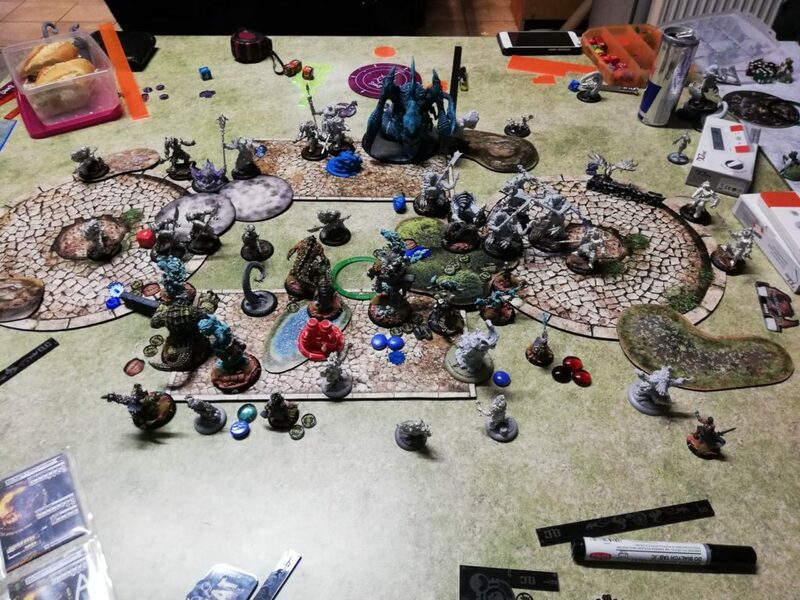 Barnabus advances forward to threat more board, casts swarm and EoBN, WE puts Starcrossed and stay on 1 fury, then I used Snapjaw and Mire’s cloud to block LOS to BLoB. After taking the photo I move Soul Slave forward. I fail to contest his zone, which I should. 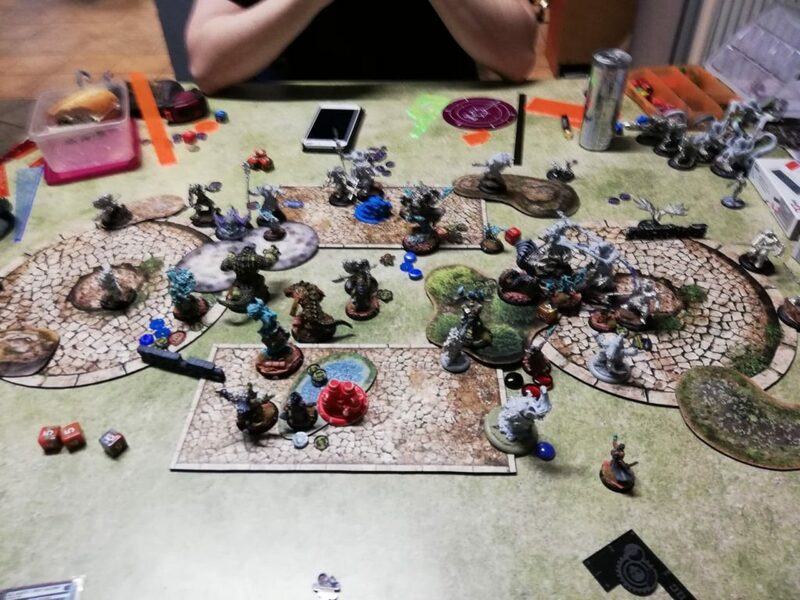 Anamag use feat, cast Carnage and walks out of Barnabus range. Warmongers on the left go in, and take out Boneshakers and left Snapjaw on 3 boxes in body. They fail to hit Boneswarm even once (Starcrossed is nice again). On the right Chosens fail to take out any system on Skaryth. Blightbringer is just out of 10 from Barnabus. My feat turn. 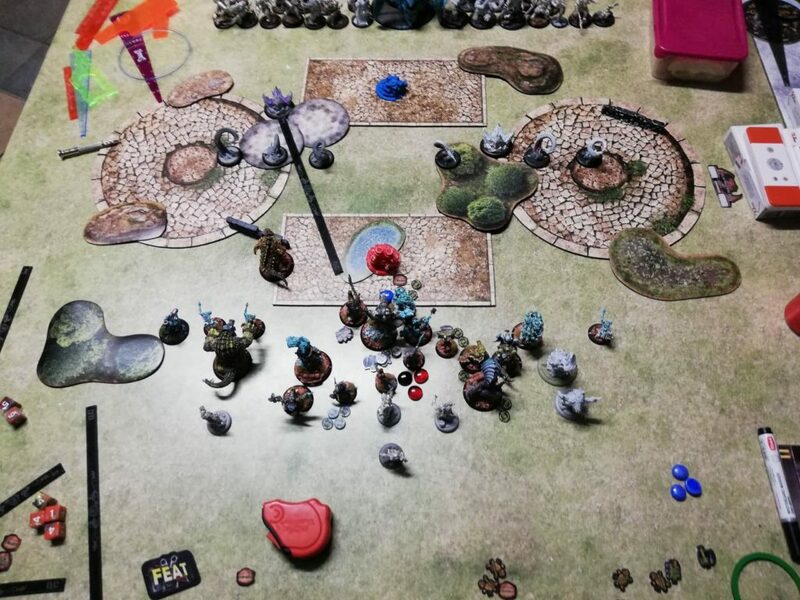 In the back Snapjaw fails to hit tentacle, so Mire clears it with spear and casts Rages on both Boneswarms. Note for myself – I again forget to Rage Skaryth. On the left Wrestler and Boneswarm clear some Warmongers. Soul Slave casts Hunters Mark on Blightbringer. Boneswarm which will be feat fuel kills Hellmouth. WE charges into Warmonger which can freestrike Barnabus but don’t kill it, then casts Starcrossed. BLoB charges into Blightbringer and takes freestrike which is transferred into Boneswarm. 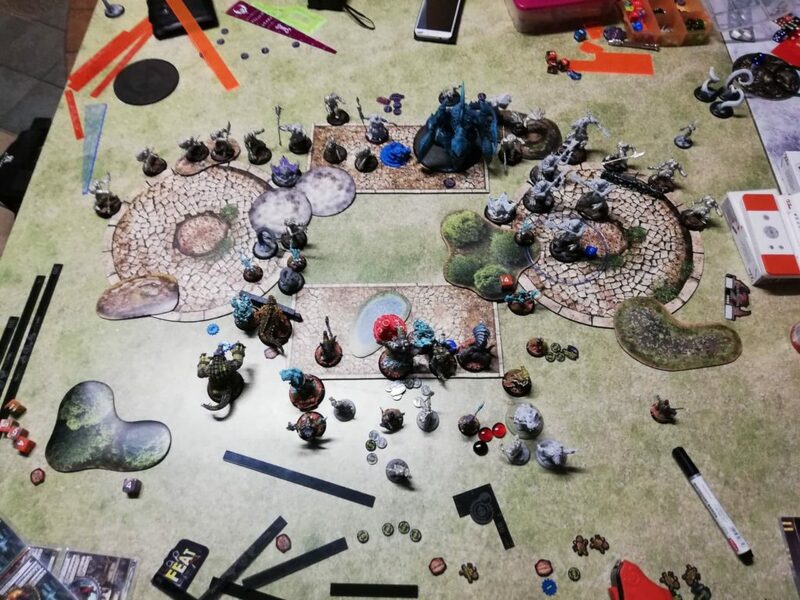 Becasue Barnabus has full stack of corpses and eats Boneswarm and 3 Bonegrinders for Fury he eats Collosal, casts EoBN and wait for dead ; ) After that I end turn with 45 seconds vs my opponents 3 minutes so we turn off the clock and play some other not very effective activation of Skaryth. So basiclly CK is best option at the moment. 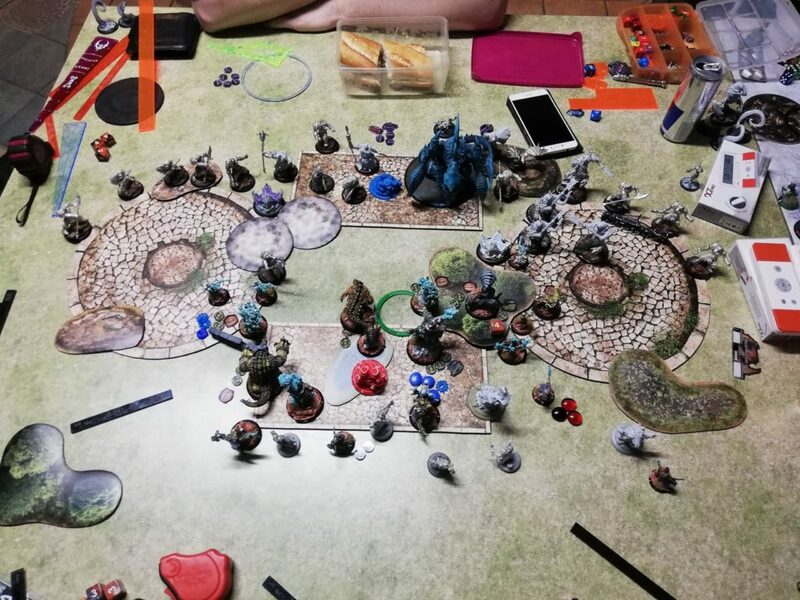 BLoB was on 2 transfers and only thing in the way for Anamag to charge him is one Boneshaker… Amok charges and misses his attack. 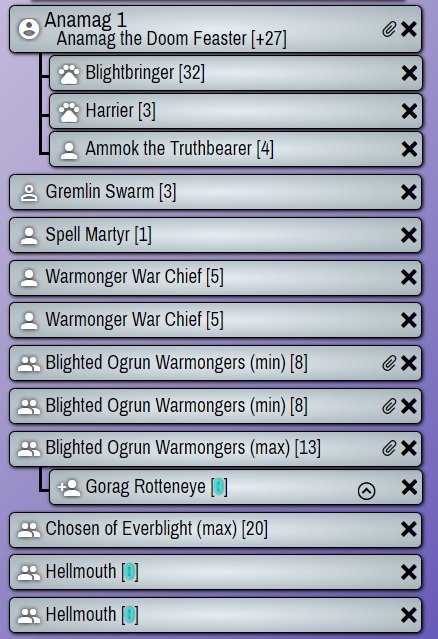 Warmonger Chieftain misses his attack on back (2×1 on Starcrossed). So now Anamag can only cast Hexblast into Barnabus, hits and takes out Swarm. Then Warmonger Chieftain, Gorax and two warmongers charge and… two attacks are 2×1 so Barnabus lives on 4 boxes and 1 transfer. My opponent concedes tillted. After triple snake eyes I don’t blame him. 1. It’s very hard MU but still feels playable. I hope that when MU def skew matters and Rebuke makes diffrence BLOB will be even more fun to play. 2. Unpacking is a thing. I have to work hard on positiong, especially Mire. 4. Playing brick like this BLoB lists is a new thing for me to learn. 5. Hellmouths weren’t as hard to deal with as my previous games vs Legion, which is nice. Tentacles needing to hit vs 17-18 Def Boneswarms is a great thing.